The Oregon Obamacare exchange has received $305 million in taxpayer-funded federal grants, spent $160 million on its busted website, dropped $10 million on hipster promotional ads, erroneously enrolled 4,000 illegal immigrants in full Oregon Health Plan coverage contrary to federal law, and has not enrolled a single Oregonian online. 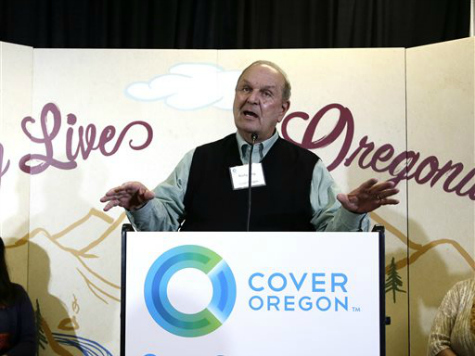 In short, the Oregon Obamacare exchange, known officially as “Cover Oregon,” has become emblematic of the deeply unpopular Obamacare program. “Cover Oregon is almost unmatched in its failure to deliver a working website,” reported the Wall Street Journal on Monday. The Government Accountability Office (GAO) announced earlier this month it would launch a probe into Oregon’s failed Obamacare website. The roughly 146,000 Oregonians who have enrolled have had to do so through paper applications, and two thirds of those counted were enrolled in the state’s Medicaid welfare program. Democratic Oregon Gov. John Kitzhaber (D) has come under fire for his failure to implement his state’s Obamacare website. In January, Kitzhaber walked out of an interview over questions about what he knew and when he knew it. Kitzhaber is expected to hold a press conference Thursday evening to reveal the results of a new Cover Oregon investigative report. Also to be held Thursday evening is a live town hall featuring members of the Oregon state legislature, including Kitzhaber’s presumptive Republican opponent, Rep. Dennis Richardson, for the Nov. 14 election. The busted Oregon Obamacare website has now devolved into a blame game, with Kitzhaber blaming website builder Oracle. However, a Centers for Medicare and Medicaid report said Cover Oregon’s mismanagement was just as responsible as Oracle’s. “It appears that CO [Cover Oregon] does not have any leverage in their contract to make OCS [Oracle Consulting Services] accountable for missing key deliverables,” the CMS report states. In 2012, Oregon also bagged $1.9 billion in taxpayer-funded federal dollars to experiment with the state’s Medicaid program for the poor. Obamacare celebrates its four-year anniversary on Sunday.